Otoplasty is a cosmetic surgery to change the appearance of a person’s external ears. 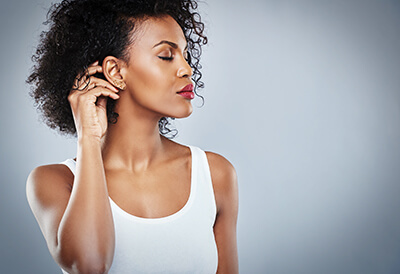 Otoplasty can take many forms, such as bringing the ears closer to the head (often called ear pinning), reducing the size of very big ears, or reshaping various bends in the cartilage. Ear surgery usually takes about two to three hours. Surgery begins with an incision just behind the ear, in the natural fold where the ear is joined to the head. The surgeon will then remove the necessary amounts of cartilage and skin required to achieve the right effect. In some cases, the surgeon will trim the cartilage, shaping it into a more desirable form and then pin the cartilage back with permanent absorbable tacks to secure the cartilage. In other instances, the surgeon will not remove any cartilage at all, using stitches to hold the cartilage permanently in place. After sculpting the cartilage to the desired shape, the surgeon will apply absorbable tacks to anchor the ear until healing occurs to hold the ear in the desired position. A small percentage of patients may develop a blood clot on the ear. It may dissolve naturally or can be drawn out with a needle. Occasionally, patients develop an infection in the cartilage, which can cause scar tissue to form. Such infections are usually treated with antibiotics; rarely, surgery may be required to drain the infected area. The risks are minimal. There will be a thin white scar behind the ear after healing. Because this scar is in a natural crease behind the ear, the problem of visibility is inconsequential. Most adults can go back to work about five days after surgery. Children can go back to school after seven days or so.